- This beautiful piece of history is a Revere 16mm Model 48 silent movie projector from the early 1950's. I saw it in an antique and vintage store. 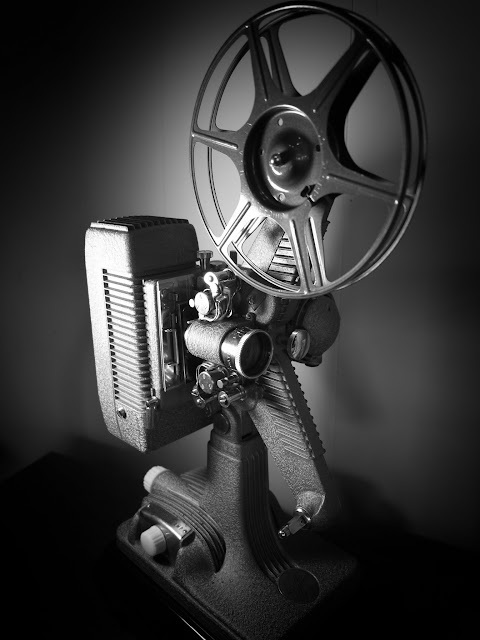 16mm films were ones we used to watch in school back in the old days, pre-VCR. One of the things I love about old film gear is the way it was made, heavy and solid but also sleek and cool. Much of this look comes from the Art Deco and Streamline Moderne industrial design movement from the 1930's resulting from era of speed in transportation. Today we call it retro but you can see its roots clearly in the "technofuturistic curvedness" of Apple industrial design. Canon G1X, 1/160 sec @ f/2.8, ISO 400, converted to B&W using Silver Efex Pro 2 in Lightroom 3.